LITHUANIA. 1919. 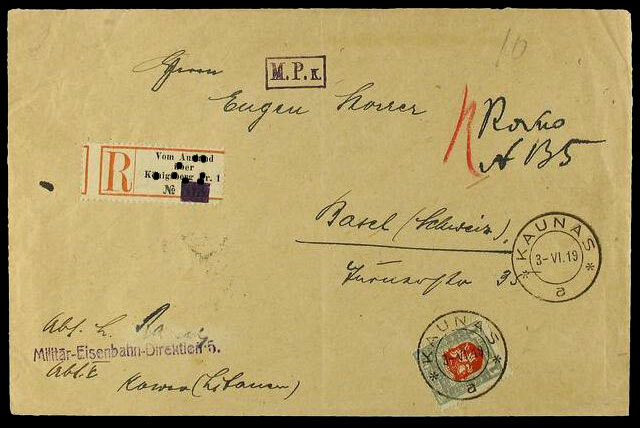 1 auk (third Berlin issue) on a Registered cover to SWITZERLAND, tied by double circle (new type) KAUNAS datestamp. Manuscript Registration in combination with German R entry label (´Konigsberg Pr. 1´) applied in transit. Front shows additional straight line MILITAR EISENBAHN-DIREKTION 5 handstamp, and reverse bears BASEL arrival datestamp.